Early Visit From Perth Amboy Fire Department! 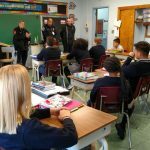 This morning representatives of the Perth Amboy Fire Department came to visit the Class of 2019, not to discuss fire safety, but to discuss American flag etiquette. 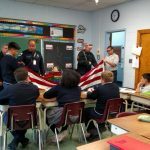 As representatives for PAFD at special ceremonies that include the raising, lowering, or presentation of the flag, the firefighters explained to the students the symbolism of each part of the flag and the meaning of the steps taken to properly fold the flag of the United States. Students then had the chance to practice properly fold the flag. 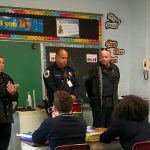 ACS Class of 2019 thanks Firefighters Perez, Vasquez, and Kehoe for taking time from their busy schedule to share their knowledge and skills with us.